So far July has brought a few lasting programs to the HYIP world, as well as a few scams. This week a program that people used to call the “new Profitable Morrows” stopped paying after 80 days in the game. Is it a good result? Feel free to draw your own conclusions. However, today I’m going to review our latest rival here on DavidNews monitor. A program called Splitt Corp Ltd has been online for 27 days in total, it joined Golden Stage Listing on Davidnews.com on July 16, 2018, and currently has the status “PAYING” on the monitor. I have reinvested $400 in the program and will keep you updated about the payments status. 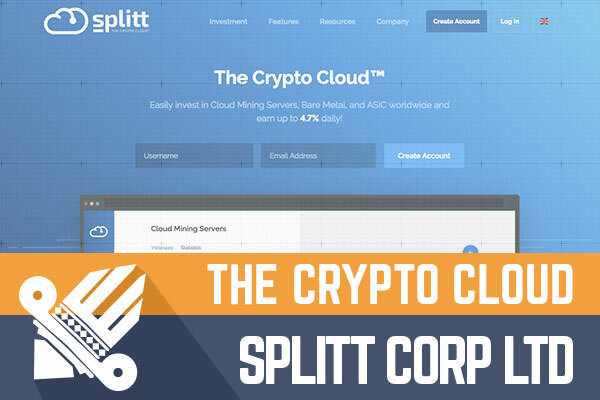 Splitt is offering to invest in cloud mining servers, bare metal, and ASIC worldwide. If this happens to be exactly what you are looking for, keep reading to find out more about the program and its features. Splitt has three investment plans – the first one called “Dynamic Cloud Mining” offer 2.64% daily for 60 days, the second plan called “Bare Metal Simplified” offer 3.5% daily for 40 days and the third plan called "ASIC Mining" offer 4.7% daily for 35 days. For all three plans, the initial deposit is included in the payments. The plans differ slightly in term of minimum and maximum investments. The investment amplitude for the first plan is from 0.001 BTC to 25 BTC, for the second plan from 0.025 BTC to 50 BTC, and for the third plan from 0.5 BTC to 500 BTC. On the user dashboard, it is easy to switch between bitcoins and dollars to track the amount of planned investment in the currency you prefer. The program accepts Bitcoin, Litecoin, Ethereum and Bitcoin Cash, Dash, Ripple (XRP) and other payment methods. Withdrawal requests at Splitt are processed instantly. The minimum and maximum amount for withdrawal is not set. Splitt is a cryptocurrency mining service that claims to take the hassle away from users. How they plan to do that? Moreover, is Splitt really an alternative to “normal cryptocurrency mining as the admins claim”? Like many other cryptocurrency mining programs, we have seen before, Splitt offers to join the cryptocurrency mining contract and do the mining from home. Join the program and forget about it. However, I have to say this cryptocurrency mining program slightly differs from the ones I have seen or reviewed lately. Admins of Splitt have worked on the content – they are providing information/opinions about cryptocurrency mining, mining problems, Split mining features etc., that I got the feeling that they kind of know what they are talking about. Of course, a part of it is just loud marketing slogans and maybe a job of a great copywriter. Anyone, a pro-miner here and can argue about their website content? The website of Splitt is also well done and leaves a professional impression. This is a website where you can find everything you need and probably a bit more within a few clicks – investment plans, calculator, affiliate program. However, there is a thing I didn’t like – the FAQ page. It is exactly opposite to the website – I didn’t find there an answer about minimum withdrawal. I would suggest mentioning it even in case there are no such minimum requirements. I also found some work in progress because I was curious to check the benchmark results on the “Plan overview page”, but unfortunately there was nothing to check just a 404 page. I already mentioned that website looks fine and designer has added a personal touch - company’s symbol a mole. The feeling that I have seen this mole or something similar before didn’t leave me while writing this review, but I guess it’s a common thing for the mining world. I have to say that I am a fan of decent HYIP websites because often a quick job on the website is related to a quick scam. Of course, this correlation shouldn’t be taken for granted. What do you think about Splitt so far? Share your thought in the chat box below! What stands behind this program (according to the legend, of course)? Split claims that they are a team of veterans of the managed hosting business with 20+ years of experience in complex hosting environments. If you want to learn more about the team of Splitt or even meet the CEO feel free to check the page “Our team”. It says on the website that Splitt was launched on May 2018, after almost a year of preparations, but in June 2018 the program was available to potential investors. If you try to search for Splitt Corp Ltd. In the Company House UK website, you will find a company with the exact name incorporated on April 4, 2018. The website has a valid SSL certificate assigned by COMODO, which expires May 2019. Domain names have been purchased in April 2018. As usual, I do always search for some extra information about programs across the Internet. For now, people on forums just share their investment and withdrawal info. Moreover, people seem to enjoy instant payments provided by Splitt. Currently no information about Splitt on Alexa, therefore it’s not possible to even make any predictions about the main audience. Their Twitter account with 44 followers seems natural. So, not much information about it online to draw any conclusions. So, let's get to the most important part – the investment opportunities. An investment calculator for each plan is available on the website. However just to make it easier to understand what’s what here a quick calculation is. For example, an investment of 0.027 BTC (approx. $200) in the plan “Bare Metal Simplified” would generate a daily return of 0.00094500. With 3.5% daily for 40 days, the break-even point is reached after 29 days. And at the end of the investment term, a 0.027 BTC investment would have made a net profit of 0.01080000 BTC. Of course, in case the program will last 40 days after the investment. Cryptocurrency mining is a popular theme among HYIPs lately. So-called cryptocurrency mining inspired HYIPs have shown both decent and poor results. Today we are looking at a comparably new program with mid-term plans that seem to be realistic in terms of running a program for some while. Moreover, it seems that admins have paid attention to details while building a website. However, always remember that any HYIP is a high-risk investment. Therefore, if you ever decide to make any investments, don’t invest more than you can afford to lose! Have you already made an investment in Splitt and have any useful information to share with us? Please drop a message in the chat box to share your experience! Investment plans: 2.64% daily for 60 days, 3.5% daily for 40 days, 4.7% daily for 35 days. Initial deposit included in the payments. Join Splitt Corp Ltd Here! On Moon Bitcoin you can claim FREE bitcoins. 514 satoshi every 24 hours.